In this article, I will share with you some of the benefits of wearing the the Aulora Pants with Kodenshi. Firstly, know that Kodenshi is a fabric technology from Japan that has been around for more than 20 years. Kodenshi garments are mainly used in the hospitals in Japan to help bed ridden patient to improve their blood circulation. It is only recently, research and development (R&D) were done on how to use the Kodenshi fabric on a garment which is comfortable, stylish and effective at the same time. Out of the R&D, the Aulora Pants with Kodenshi was introduced into the general market. The Kodenshi fabric technology uses ultra-fine ceramic particles which are integrated into the fiber. 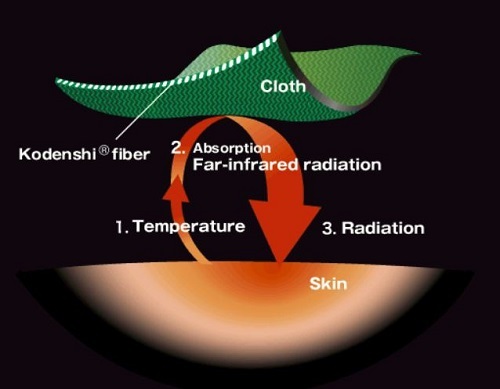 When the material touches your skin, it will absorb your body heat and emits far infrared rays (FIR). It is the FIR which penetrates into your skin and improves your body blood circulation. The FIR emitted by the ceramic particles is natural and since it absorbs only your body heat, it is totally safe on the wearer. Apart from the Kodenshi fiber, the Aulora Pants also has special compression elements for your waist, hip, buttock, thigh, knee, calf and ankle. It is the combination of both Kodenshi technology and compression elements on the pants which lead to the results below. The Aulora Pants is actually a health and wellness pants. Most people do not know, it is actually a medical grade compression pants. What are the benefits of wearing the Aulora Pants? The following are 7 types of results gathered from people that have tried the pants. The most common results from wearing Aulora Pants is slimming. Just go to Facebook and do a search on “Kodenshi slimming” and you will find many testimonials from people that have experienced slimming results from wearing the pants. The slimming effect is due to your improved blood circulation. When you have better and faster blood circulation, one of the benefits is higher metabolism which helps you to burn fat faster. When your body is burning stored fat at a faster rate, after some time, you will see slimming results on your body. Obviously, the slimming results will depend on your daily food intake and also your lifestyle. I’ve written another article on how to reduce varicose veins. You can read the article from the link below. Generally, the reduction in the appearance of varicose veins is due to the compression elements of the pants. This benefits is very effective for ladies that has just given birth. This is the effect from the FIR and the compression element on the waist. As you can see from the testimonials below, some people that have worn the Aulora Pants experienced some bow leg correction. If you have issues with water retention, the effect from wearing the Aulora Pants is very fast. If you have water retention and when you wear the pants, you will be constantly going to the toilet to pee. This happens even if you are not drinking large amount of water. When you seen testimonials from people that experienced fast weight reduction from wearing the Aulora Pants, it is due to the effect of the pants getting rid of excess water from their body. As you can see from the testimonials below, some people noticed an improvement on their skin condition after wearing the pants. This may due to the improved blood circulation and their body got rid of impurities and toxin from their body. There are also many general health improvement testimonials. This is mainly the effect from improved blood circulation. The organs and cells in our body have the ability to repair and heal itself. What’s required are a constant supply of nutrients and oxygen from our blood. When your blood flow is better, your organs and cells are receiving more of what’s needed to speed up the repair and healing process. The above are just 7 types of benefits from wearing the Aulora Pants. Are there other benefits? I am sure there are. The only thing is the testimonials were not recorded or shared. A note of disclaimer here. The results above are not typical. You may or may not experience similar results from wearing the Aulora Pants. This is because the effect of wearing the pants depends largely on your genetic, body type, body fat composition, current health condition, the type and amount of food you consume daily, your lifestyle etc. How would you know if the Aulora Pants will work for you? To be honest, I do not have the answer. To really know for sure is to wear it.